PastryWiz step-by-step cake decorating instructions. 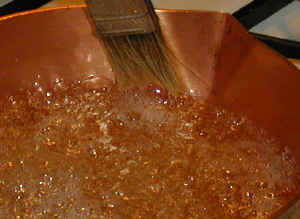 Using a brush, dipped in water, wash down any residue and sugar crystals that stick on the side of the pan. 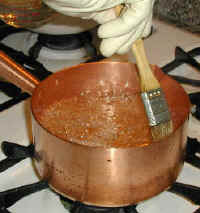 You are brushing just slightly above the boiling sugar (see picture). 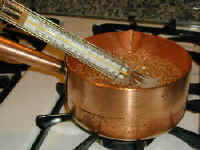 Don't use too much water, as the water will cool down the sugar temperature, increasing the cooking time. Repeat the foaming and washing down 3 or 4 times until the sugar is nice and clear. and add the cream of tartar. 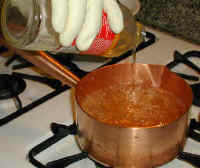 Adding the corn syrup and cream of tartar at 230 F (110 C) will reduce the risk of discoloration. Now, raise the flame on the burner to its highest level. Place a sugar thermometer in the pan. Do not stir anymore. Boil the sugar until the temperature reaches 300 to 315 F. (150 - 157 C). The higher temperature will result in a harder sugar which is more difficult to work with. Beginners should use the lower temperatures for easier handling. Once you reach the desired temperature, remove the sugar from the flame immediately. 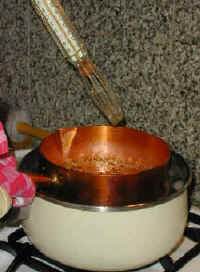 Cool it down by putting your sugar pot into another pot filled with cold water for approximately 30 seconds.